Balmacara Estate is an outstanding example of a Highland crofting estate. Crofting is a small-scale and low-intensity form of agriculture that has great environmental benefits, as well as being the defining social system of Highland communities. The estate’s rocky, moorland-covered hills are interspersed with lochs, woodlands and crofting settlements, with a long and intricate coastline scattered with offshore islands. This diversity means the estate supports a wide variety of wildlife and plants native to the Scottish Highlands including otters, pine martens, red squirrels and the ancient oak woodland of the Coille Mhòr. The landscape of Balmacara Estate has been worked by humans for thousands of years and is full of archaeological sites and historically significant buildings that give an insight into the development from early settlers to the crofting estate seen today. 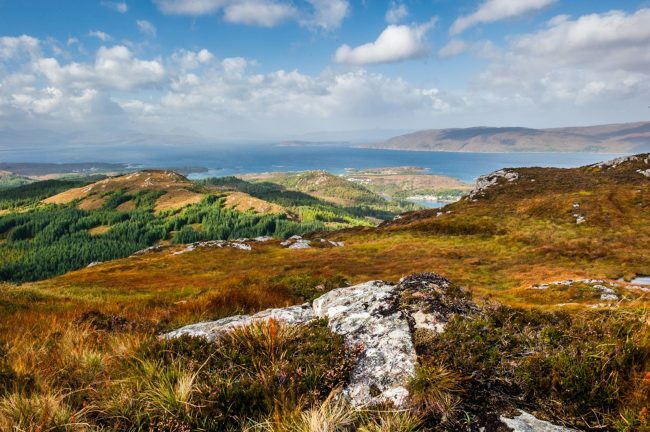 The landscape can be explored using the road network and the 16 miles of footpaths that weave through the townships, woodlands, across hills and along the coastline, offering spectacular views of the estate and the surrounding Highlands and islands.